Animal 2 is just as good as the original. James "Animal" Allen (Rhames) is back in jail for a crime he didn't commit. On the outside, his son James Jr. is framed for murder. The only way James Jr. stays out of jail is that Animal fights Mexican and Black prisoners. As usual, Ving puts in a good performance as James. Shannon as Darius makes you forget that Terrence Howard was the original character. He has a great speech towards the end. There's also some decent fight scenes. The only problem with that is during the fights the movie repeats the same music over and over again. But that's not a big deal. The movie lays the groundwork for an "Animal 3" which I would look forward to seeing. 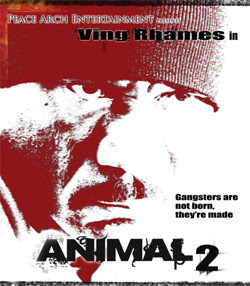 Animal 2 is just as good as the first one, which is surprising for a DTV sequel.